SLC Villas are located in Tong Yang in the west of the island of Koh Samui at a lake with clear water and a rich fauna and flora. The houses are partly built onto the lake. SLC Villas are an assembly of 5 individually designed holiday homes with one or two bedrooms, made of former containers. Because of the plants and the lake not being deep, it is not suitable for swimming and bathing, but if you enjoy a view over a floating carpet of lotus flowers and water lilies or watch a heron catching a tasty fish for dinner, as well as many other birds attracted by water, this is the place for you to be. End of 2015 a pool will be added for the convenience of the guests. A well kempt, small garden lies between the house and the driveway. Four steps lead up onto the roofed front terrace furnished with a wooden bench, a table and chairs. A ceiling fan generates a cooling breeze. Through a glass door you enter the house and reach the living- kitchen area. The living area is furnished with a comfortable, L-shaped sofa, a table, a side board and a TV. To the left you find the open kitchen with fridge/ freezer, sink, stove and water cooker. Next to the kitchen is the entrance to the bathroom with shower, washing basin and toilet.To the right adjoins the bedroom with a double bed, wardrobe, small furniture and air conditioning. At the left side of the house a boardwalk leads to the back of the house where you find the partial roofed lake terrace with a table and two benches. From here you have an unobstructed view out onto the lake and the wide landscape. Apr., May, Sept., Oct., Nov. 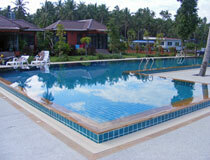 If you like the house and you plan a longer stay on Samui feel free to ask for a discount. For inquiries please contact: wolfgang@samuihouserentals.com - please name the house you are asking for.